ISO 9001:2015 requires your organisation to identify any outputs that do not conform to their intended requirements and ensure they are not delivered to your customers. Robust controls must be established and implemented. However, many organisations fail to properly manage nonconforming (NCR) outputs. A lack of data and process integration leads to quick conclusions made by a single department. Mistakes are repeated and risks associated with corrective actions are not considered. A technique commonly used for managing NCRs is 8D (eight disciplines). In this article, Kate Armitage, Head of Quality Assurance at Qualsys has explained 8D and included a template PPT you can use to train your internal team on using this problem solving technique for NCRs. An interdisciplinary team must be set up for the purpose of processing the concern. The team leader coordinates all activities and reports to the customer. With Qualsys's software, administrators are able to allocate roles and responsibilities from the central management system. 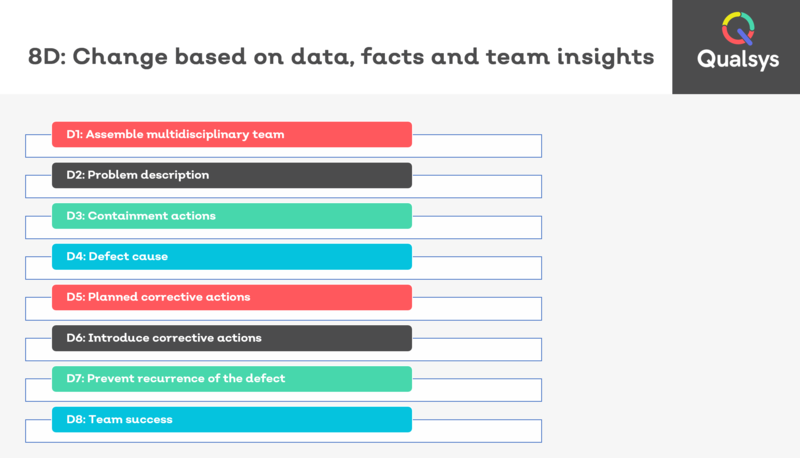 The team must define the issue, detailing who, what, when, where, why, how and how many. The below form in Issue Manager captures all the necessary fields. In order to limit the damage, any supplies affected by the problem in the production facility, warehouse, at the subcontractor's premises, en route to the customer, or at the customer's premises, must be located, quarantined and marked immediately, or recalled if already delivered. The supplier establishes what further containment actions are required e.g. inspections, sorting etc. need to be taken and checks their effectiveness. There must be coordinated activities to sort the deliveries and mark affected materials. Standard analytical methods, such as “Ishikawa” (fishbone diagram) or the 5 "Whys", must be used to determine the actual cause(s) of the problem. This is where many businesses go wrong. Don't accept the first result. Encourage your team to challenge the real cause. After determining the cause(s) of the defect, there must be corrective actions to solve the problem in the short term. 6. Obtaining authorisation or acceptance under a concession. Documented evidence of the effective­ness of these measures must also be provided. Corrective actions, which reliably prevent the defect from recurring, must be defined in agreement with the relevant customer plant and in accordance with the effectiveness proven under Discipline 5. Suitable comprehensive measures must be taken in order to prevent the defect from recurring in conjunction with similar products or processes. Product and process documentation, such as the FMEA, Control Plan, guidelines, technical specifications, drawings and work instructions must be updated in line with the established cause(s) and corresponding corrective actions. The results that have been introduced effectively by the team are acknowledged by the team leader and approved by the customer.